Speaking of books you’re going to love… let’s begin with one of our most beloved authors, Rabbi Dr. Abraham J. Twerski. Rabbi Twerski is the scion of a great Chassidic dynasty, a psychiatrist who has spent a lifetime delving into the secrets of the human psyche, and, of course, one of the Torah world’s bestselling authors. In his newest book, Messages from the Mishnah – his 40th (!) book published with ArtScroll – Rabbi Twerski brings his unique perspective, incisive intellect, and warm understanding of human nature to the timeless words of Mishnah. In this beautifully-designed, large format coffee table book, the companion volume to Twerski on Chumash, Rabbi Twerski draws upon a wealth of varied Torah sources to examine the Mishnah, finding messages that are startlingly relevant to our personal lives as well as to today’s issues and challenges. The halachos of the Shema can teach us how to avoid the dark side of technology; the laws of charity show us how to interact with others. Rabbi Dr. Twerski, in addition to his many other accomplishments, is a marvelous storyteller, and his tales of Chassidic masters enliven the book. The roots of Messages from the Mishnah go back decades. As Rabbi Dr. Twerski remembers: “Back in 1945, I met Rabbi Yehuda Leib Ginsburg. [Rabbi Ginsburg was a Rav in Denver, a member of the Vaad Hatzalah, and an author of many important sefarim.] I was impressed by the man and his prolific writings. One of his projects was to show the mussar in the early prophets and in the Mishnah. “Of course, Pirkei Avos is all mussar. But Rabbi Ginsburg showed that many of the ‘purely halachic’ mishnahs also contained mussar principles. That idea incubated from 1945 to the present, and led to my analyzing ‘halachic’ mishnahs for their mussar content. 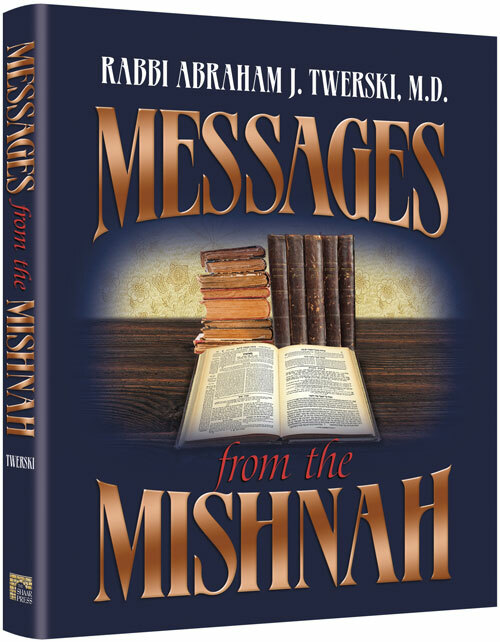 **Click here to purchase Messages from the Mishnah.